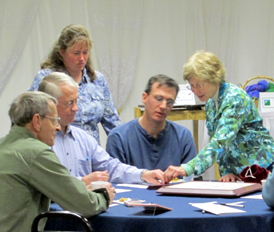 Some of the tips are specific to team Scrabble®; others are also applicable to one-on-one competition and other variations. When it's your turn, discuss possible plays among yourselves (don't talk when it's the other team's move). Discuss several alternatives unless there is one obviously great play or you're running out of time. If talking would reveal too much of your rack (for instance, if you are holding a blank tile), write your ideas for your teammates to see. The winners will be determined by total points, not games won, so generally choose high-scoring plays over defensive moves. Blank tiles, which can be used instead of any letter, are extremely valuable for 50-point-bonus "bingo" plays (using all the tiles on your rack), so don't squander them on low-scoring moves. The same holds true, to a lesser degree, for the "X" and "S" tiles, in particular. Aim, when possible, to make plays that leave good tiles in your hand, so that you have a better chance of a bingo on your next play. Don't be afraid to give up a turn by exchanging weak tiles, such as a rack of six or seven vowels (keep an "E," exchange the rest). In the long run, you will usually score more than if you have to make several low scoring plays in a row because of bad racks. Again, total points will determine winners. The letters RETINAS, plus the blank, are the best letters in the bag for making bingos. Play fairly quickly when possible. You want to be sure to get as many plays as possible made before time expires, so as to get the highest score. Be careful about making challenges unless you're SURE the other team's play is not a word, or if it's such a high-scoring play that you feel you have to take a risk. Otherwise, it may be better to make sure that you don't lose a turn. Congratulate your teammates when they come up with good plays. Likewise, congratulate your opponents for good words. Most important, HAVE FUN and remember you're supporting a good cause — literacy efforts in Androscoggin County. Read the latest posts from LVA staff, tutors, and students. For more on how you can help, click here.